Faby submitted Taya. Cuervo was hanging out near ringside during the match and attacked her after. Faby fought him off but the rest of La Secta attacked. Cuervo asked Taya if she'd like to take Faby's hair, and suggested they challenge for the mixed tag titles. Moved to the second. Australian Suicide was the mystery person, as usual, and was welcomed to AAA by taking Psicosis staples to the chest. Gringos hit their usual move on Steve Pain for the win. 3) Fénix & Octagón b Eterno & Pentagón Jr. Moved to the third. Fenix landed a tornillo on Eterno. Made a cage match. Order of escape was Monsther, Silver, Murder, Mascara and Psycho gave Texano a Canadian Destroyer to escape. La Secta attacked Psycho Circus after the match and challenged for the trios titles. Official results do not list Mamba & Pimpi, but they're visible in pictures. Cuervo distracted Faby and Mary beat her. Cuervo cut off part of Faby's hair and has a bounty on the rest. Changed to first block. La Secta caused Mesias to get beat. Fenix beat Silver King for the win. Block originally listed a mystery luchador, which was quietly listed to be Blue Demon Jr. Prior to the match, Consejo introduced their newest member - Hijo del Fantasma! 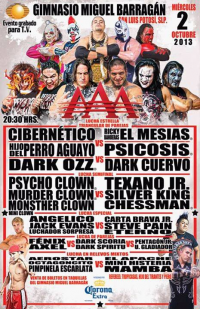 Pentagon Jr. was originally listed in the match, but appears only to have interfered. There was no explanation of why Blue Demon Jr. was listed or why he wasn't there. Silver King helped Fantasma the match. Fantasma beat Daga to win. Mascara and Electroshock were out first. Zorro 'returned', and AAA played up that he and Parka Negra were in the same place. (Zorro had been playing the role of Parka Negra, so this was a surprise for people who knew.) Zorro appeared to still be crazy and tossed his cane in, but seemingly to no one in particular. La Parka got it and got the win. La Secta attacked everyone. Perro & Cibernetico got counted out due to the attack and are now friends again. Chessman beat Psicosis with a spear. Espiritu has a new face paint style, while Aerostar had a new outfit. Joe Lider & Crazy Boy are champions. 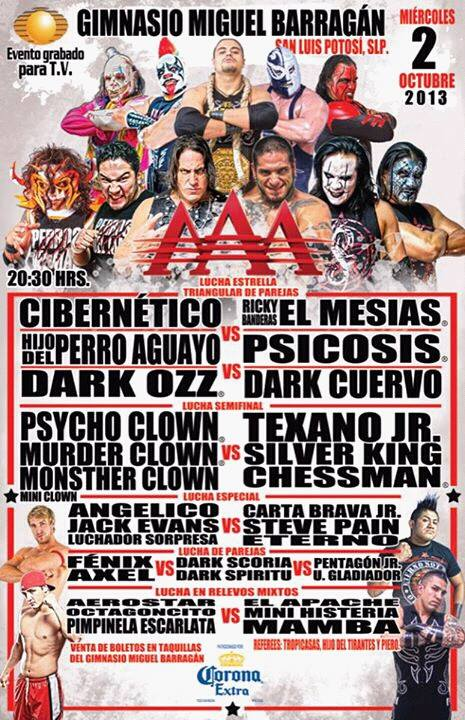 Pentagon Jr. & Ultimo Gladiador were listed on the original poster, but Espiritu & Scoria are apparently in instead after winning a three way in SLP. Juvi accompanied the Mexican Powers to the ring. Mexican Powers beat Drago & Aerostar, Secta lost after Perro & Cibernetico attacked, and Angelico & Jack won when Juvi shoved Lider off the top rope thru a table and hit Crazy Boy with a chair. Juvi revealed a new shirt with "A" apocalypse symbol. Psycho wore gold and silver arm sleeves in tribute to El Brazo, while Texano was dressed up like hsi father when he was part of the Misionerios de la Muerte. Murder and Hijo del Fantasma worked as seconds. Referee issues, near falls and lots of blood. Texano beat Psycho with a powerbomb to keep his title. Texano's ninth defense. Event Notes: El Brazo and Antonio Pena were honored before the show. Alebrije was among those out for the moment of silence.